Stabilin-1-Mediated Efferocytosis Protects against Vascular Leakage in Sepsis: A Novel Therapeutic Approach? Sepsis is a complex clinical syndrome with high lethality characterized by systemic inflammation and organ failure. Although intensive research over the past decades has identified several mechanisms contributing to sepsis pathology, sepsis represents a major therapeutic burden. 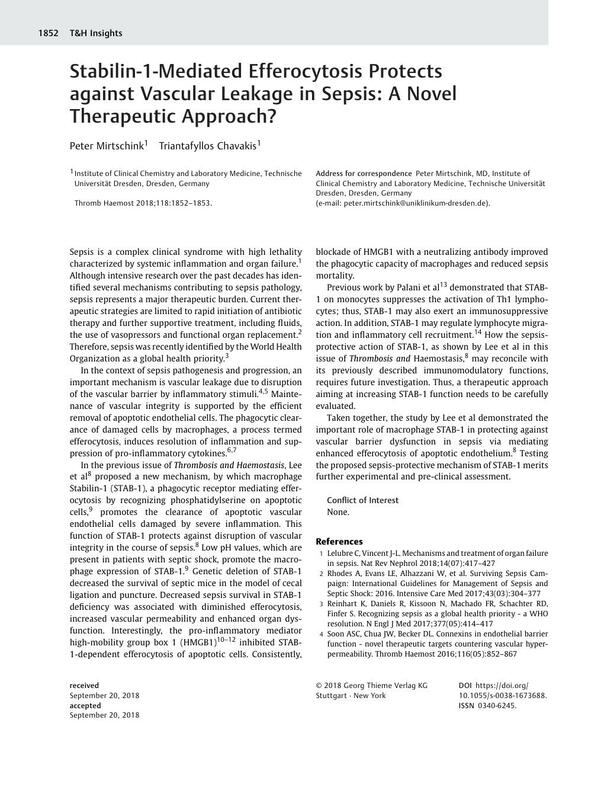 Current therapeutic strategies are limited to rapid initiation of antibiotic therapy and further supportive treatment, including fluids, the use of vasopressors and functional organ replacement. Therefore, sepsis was recently identified by the World Health Organization as a global health priority. In the previous issue of Thrombosis and Haemostasis, Lee et al proposed a new mechanism, by which macrophage Stabilin-1 (STAB-1), a phagocytic receptor mediating efferocytosis by recognizing phosphatidylserine on apoptotic cells, promotes the clearance of apoptotic vascular endothelial cells damaged by severe inflammation. This function of STAB-1 protects against disruption of vascular integrity in the course of sepsis. Low pH values, which are present in patients with septic shock, promote the macrophage expression of STAB-1. Genetic deletion of STAB-1 decreased the survival of septic mice in the model of cecal ligation and puncture. Decreased sepsis survival in STAB-1 deficiency was associated with diminished efferocytosis, increased vascular permeability and enhanced organ dysfunction. Interestingly, the pro-inflammatory mediator high-mobility group box 1 (HMGB1)   inhibited STAB-1-dependent efferocytosis of apoptotic cells. Consistently, blockade of HMGB1 with a neutralizing antibody improved the phagocytic capacity of macrophages and reduced sepsis mortality. Previous work by Palani et al demonstrated that STAB-1 on monocytes suppresses the activation of Th1 lymphocytes; thus, STAB-1 may also exert an immunosuppressive action. In addition, STAB-1 may regulate lymphocyte migration and inflammatory cell recruitment. How the sepsis-protective action of STAB-1, as shown by Lee et al in this issue of Thrombosis and Haemostasis, may reconcile with its previously described immunomodulatory functions, requires future investigation. Thus, a therapeutic approach aiming at increasing STAB-1 function needs to be carefully evaluated. Taken together, the study by Lee et al demonstrated the important role of macrophage STAB-1 in protecting against vascular barrier dysfunction in sepsis via mediating enhanced efferocytosis of apoptotic endothelium. Testing the proposed sepsis-protective mechanism of STAB-1 merits further experimental and pre-clinical assessment.